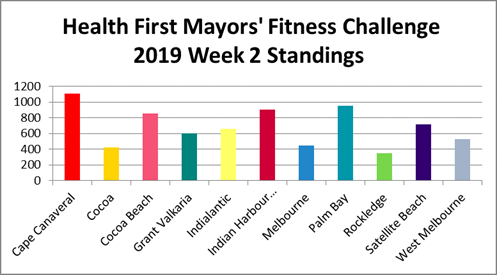 Eleven Mayors in Brevard are challenging their citizens to get involved in a healthy competition – the Health First Mayors’ Fitness Challenge. Each Mayor will assemble the largest possible group of people from the community to form a city team. Everyone who joins for a municipality is considered part of that mayor's "team." All you have to do is start moving and track it! The 8-week challenge begins on Saturday on February 2 and runs through March 30, 2019. Congrats to the City of Palm Bay! A big factor is that they maximized bonus points (250) for the children participating! Sign up kids here! This portion of the Mayors' Fitness Challenge is an individual weight loss competition among adults 18 and over. ▪ All participants must be weighed in at a participating Health First Facility (*) between January 21 and February 1, 2019. Click here for times and locations. Cash Prize For the Great Weight-Off Competition! $500 for the individual who loses the highest percentage of body weight during the 8-week challenge. Must be weighed in at the Kick-Off Event or at a Health First Facility click here for times and locations. 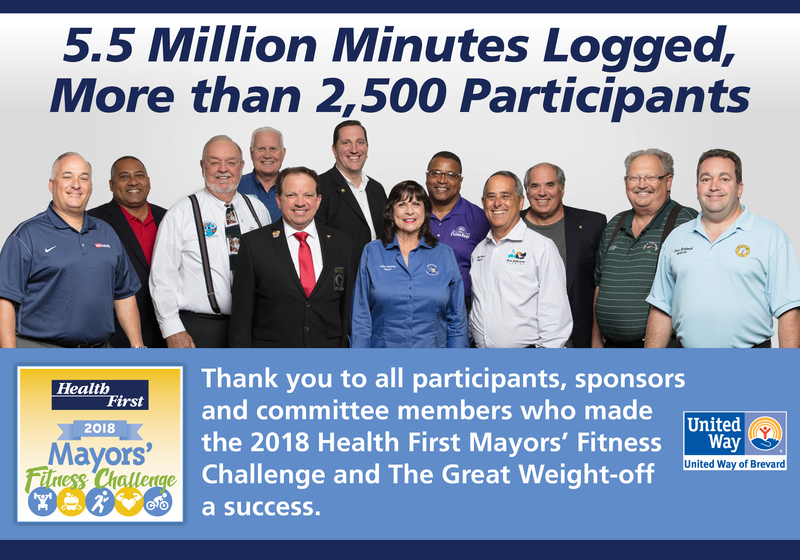 Join your fellow participants in one of four community walks hosted by local Mayors to kick off the Health First Mayors’ Fitness Challenge. Wear your team t-shirt and show your pride for your community! Q. How do I register myself and my family for the Mayors' Fitness Challenge competition? A. 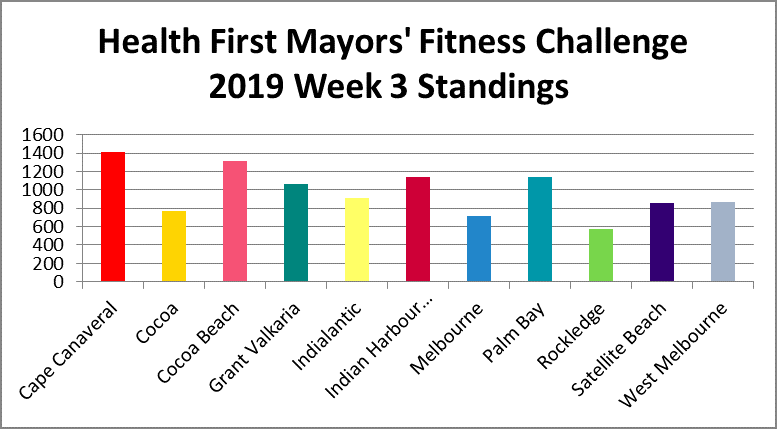 All registrations for the Mayors' Fitness Challenge and Great Weight-Off must be submitted online. Click here. A. There is no fee. We encourage everyone to invite their family, friends and co-workers to join in the fun and become more active. Q. What types of activities can we engage in to track our minutes each week? A. Most municipalities will be providing their teams with a list of activities happening in their community. In addition, families can walk, run, bike, swim or participate in their favorite games or sports together. During this 8-week competition, it is important for everyone to track all minutes spent doing any physical exercise to give their team the best chance at winning. Q. How do I report the number of minutes I exercised? A. You will receive a survey by email every Friday. YOU MUST REPLY TO THIS EMAIL EVERY WEEK. Important Note: Every city has the option to track the minutes of their participants independently. This option was created for cities who do not have a large percentage of their population online or connected by email. The team captain will track and report minutes independently and report the numbers by submitting an excel spreadsheet weekly. Q. How will you know I actually completed the minutes I am reporting? A. Minutes spent exercising will be reported on an honor system. This is a friendly competition between municipalities and we encourage members of our community to be honest about their achievements. Q. What team do I join if I live in an unincorporated part of Brevard County or live in a city that has chosen not to participate? A. You may join the municipality that is closest to you or you may join in another municipality you are associated with. For example, if you live in an unincorporated part of Melbourne and work for the city of Palm Bay, you may choose to either join the Melbourne team or the Palm Bay team. Q. Can everyone attend the Kick-Off Events on February 2? A. Yes, we encourage all members of the community to come out and get moving! Q.Can I register my child for the Great Weight-Off competition? A. No. Although children under the age of 18 are encouraged to participate in the Mayors' Fitness Challenge, they are not eligible to be part of the Great Weight-Off competition. Q. What are the cash prizes for the Great-Weight Off? A. There are 2 winner categories: The man who loses the largest percent of body weight and the woman who loses the largest percent of body weight. Each winner will receive a cash prize of $500. Q. After registering for the Great Weight-Off, when is the first weigh-in and do I need to make an appointment? A. Initial weigh-ins will be held at Health First facilities or at one of four kick-off events. Click here for times and locations. Q. How often do I need to weigh in? A. There will be two weigh-ins, the initial weigh-in and the final weigh-in. The final weigh-in will be held at the same locations. The last date to weigh-in before the Awards Ceremony will be Monday, March 29. Special thanks to the Get Healthy Brevard Team. This committed group is the planning committee for the Health First Mayor’s Fitness Challenge. They work in conjunction with United Way of Brevard to advance our efforts to improve the health of our community. This group meets on the 2nd Wednesday of each month from 8:30-9:30am. Any member of the public is welcome. Thank you to our title sponsor HEALTH FIRST. 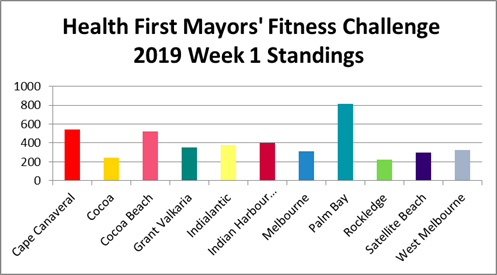 Congrats to the 2018 'Most Fit City' City of Cocoa Beach with 10,623 points! Twelve mayors and 45 Space Wing (Patrick AFB/Cape Canaveral AF Station) challenged their citizens to get involved in a healthy competition – the Health First Mayors’ Fitness Challenge. Each Mayor assembled the largest possible group of people from the community to form a city team. 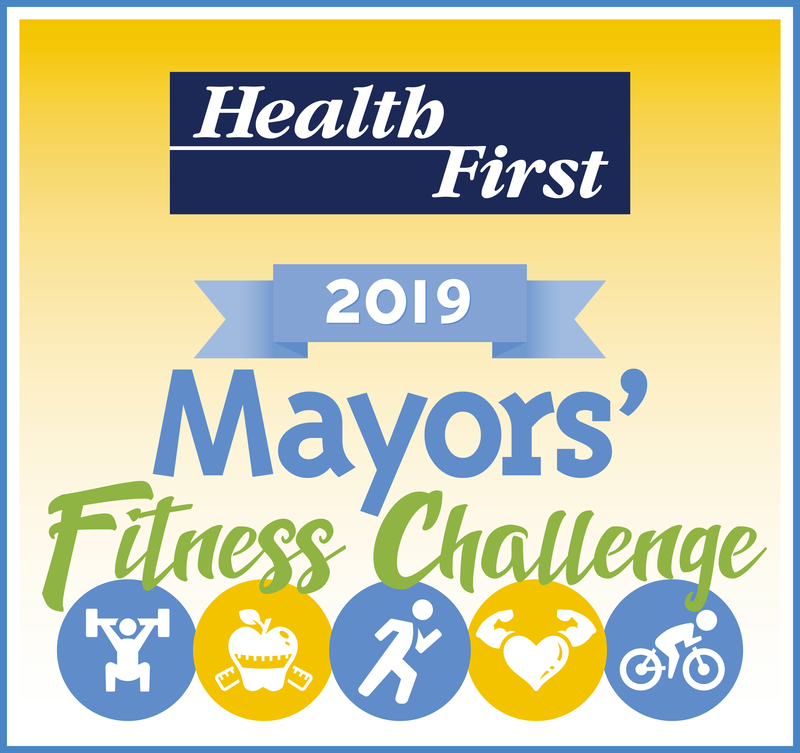 The 2019 Health First Mayors' Fitness Challenge kicks off February 2, 2019. Registration opens mid-December and runs through January 14, 2019. Interested in sponsoring click here. Special thanks to the Get Healthy Brevard Team. This committed group is the planning committee for the Health First Mayor’s Fitness Challenge. They work in conjunction with United Way of Brevard to advance our efforts to improve the health of our community. This group meets on the 2nd Wednesday of each month from 8:30-9:30am. Any member of the public is welcome. Thank you to our title sponsor Health First.